Making the five and a half to six hour drive from my home in the far southeastern corner of Wisconsin to my cabin in northwestern Wisconsin, I exit Interstate 94 at Eau Claire, and head north on state highway 53, a four lane asphalt artery that extends all the way to the state’s far northwestern extremity, the city of Superior. For years, I always turned off of 53 at the exit for the town of Bloomer, until a few years ago, my dad showed me a shortcut. By taking the next exit, Highway 64, and cutting across on a short country road I never learned the name of, I could connect to county Highway F and take it north to Highway M, thus avoiding the busy metropolis that is downtown Bloomer and shaving maybe a minute off of my trip. Being the son of an over the road truck driver, I was raised with a healthy respect for the shortest pathway between two points, and now that he’s gone, choosing his shortcut is but one way I honor my dad’s memory. But every once in a while, when I have time to kill and I feel the need to engage my writer fantasies, I take a couple of extra minutes and continue north on Highway 53 until I get to the County Highway M exit at the town of New Auburn, Wisconsin. You have to look close, or you’ll miss what sets New Auburn apart from any of the other small towns in the area. In fact, if you don’t look close, you’ll risk missing New Auburn all together. But if you’re awake and paying attention, it’s right there for you to see: New Auburn is the only town I know of that has a photo of a book on its road signs. The book is Population: 485, and it was written by Michael Perry. You might know Michael Perry as the host of the NPR show Tent Show Radio, or as the singer and songwriter for the band “The Long Beds”, or as the humorist with his one man show, The Clodhopper Monologues, or as the New York times bestselling author of the memoirs, Off Main Street, Truck: A Love Story, Coop, or last year’s Visiting Tom. 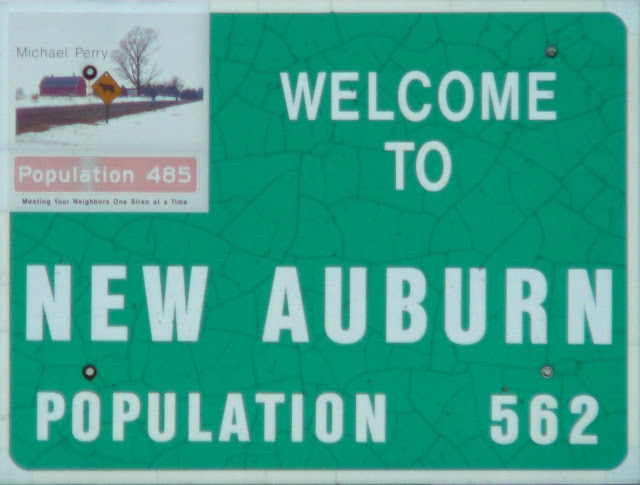 Population 485 remains the book that put Perry, and tiny New Auburn, on the map. It was selected as an entry in 2013’s World Book Night. Population 485 chronicles Perry’s return, after a nineteen year absence, to New Auburn, where he grew up. Shortly after moving back, he joined the volunteer fire department, where two of his brothers were also volunteers and his mother was an EMT. The book draws upon Perry’s experiences as a first responder and small town resident, getting to know new neighbors and being reacquainted with old friends. It’s funny and harrowing and sad. It’s about life and all of its absurdities, and it’s about death, as in the literal death of strangers and loved ones, and in the figurative slow death of a way of life. "Summer here comes on like a zaftig hippie chick, jazzed on chlorophyll and flinging fistfuls of butterflies to the sun." Population: 485 was a revelation for me, proof that I wasn’t the only one out there who enjoys both deer hunting and poetry. It confirmed what I already knew, that beneath the stereotypes our culture marginalizes the inhabitants of rural small town communities with lie real people, people with eccentricities and shortcomings and flaws, but real nonetheless, capable of grace and love and honor. The fact that their way of life and the land to which they are attached is under assault lends an aura of urgency to the book and to Perry’s subsequent work, including last year’s Visiting Tom, a triumph in capturing the heart and soul of a vanishing time and people. ﻿﻿﻿﻿﻿﻿﻿﻿﻿﻿﻿Visiting Tom looks at Mike's new neighbors (since Population: 485 he's moved to a farm near Fall Creek, about thirty miles south of New Auburn), eighty-two year old Tom and his wife, Arlene. Tom has lived his entire life on the same farm, and watched when, in 1967, the government installed Interstate 94 right through the middle of his property. Perry contrasts Tom's experience with "progress" to his own struggles with the local government over improvements to the road going up the hill to his house. In the meantime, he is getting to know Tom better, and learning a whole lot of history, about Tom and Arlene and how farming used to be done. The book is about time and progress and life and death, but more than anything, it's about neighbors, and the responsibilities and rewards that come with getting to know one another. This, to me, has always been Perry's unique gift - the ability to articulate our need to connect with other people. He shows us what's human in even his most bizarre and eccentric characters, and grants them the simple and decent respect any human being deserves. Visiting Tom reminds us that we're all in this thing together. I was born in Rice Lake, Wisconsin, just up Highway 53, a piece from New Auburn. Though I’ve lived most of my life in southeastern Wisconsin, my ancestors came to this country and settled not far from where Population: 485 takes place, and I still have a number of relatives who live in the area. I own a cabin and some hunting land just south of the town of Bruce, and I spend quite a bit of time there. It's these credentials plus my writer ambitions that made me feel a sense of connection to Perry; in reality, it’s probably no deeper than the connection all of his readers feel to his work, the connection to what’s still inside us that was passed down from those who went before, the connection of our past to our present. Dave Gourdoux (DG): The common theme, or subject of your writing, seems to be concerned with the intersection of time and place. I love the scene in “Visiting Tom” when you explain your technique with the scythe to Tom, and ask him if you’re doing it right, when he replies that it sounds about right and then suggests you try “one a’ them gas-powered weed-whackers.” Your work frequently walks the tightrope between nostalgia and reality, and reveals truths that are either new to us or have been buried within. How aware are you of this balancing act when you write, and how do you prevent yourself from tipping too far to either nostalgia or harsh reality? Michael Perry (MP): I'm always aware of that balance, but I don't always get it right. Nostalgia is a powerful source of reflection and evocation, so I find it disingenuous to dismiss it out of reflex. On the other hand, one does not wish to dredge readers through a nonstop nostalgia marinade. Tom's response was the perfect technicolor exclamation point after all my sepia tones. DG: One of my favorite anecdotes from” Population 485” is the one where they wanted to put you on a float in the Jamboree Days parade with a sign that said, “Writer.” I’m interested in the on-going relationship between the artist and his subjects, and how each perceives the other. How has success changed the way your neighbors perceive you? Do you ever find folks either becoming more reserved or guarded with you, and contrarily, do you ever feel that some folks are performing for you, or auditioning for your next book? MP: Mostly my neighbors know me as a self-employed husband and father who sometimes needs help pulling his pickup out of the snowbank. And when they see my used minivan they understand whatever success I've had, I'm not bathing in coin. Sure, every now and then someone will say something and another person will ask, "You gonna put that in a book? ", but it's nearly always in good humor. I have indeed had people ratchet up their performances when they thought I was looking for material. In one case, I just took the guy (a fellow firefighter known for pithy quotes) aside and said I was done with the book so he could give it a rest, and furthermore, his new material wasn't up to snuff. That was fun! DG: You've published four book length memoirs, each with a distinctive theme and narrative. Do you worry about repeating yourself, about becoming formulaic? MP: I worry about that constantly. In fact, somewhere recently I said or wrote: "I have reached that stage in my life where every time I open my mouth I am either repeating myself or contradicting myself." I've recently taken on two fiction contracts just to give myself a little enforced breather from nonfiction memoir. DG: You have a terrific eye, and a tremendous ability to derive and articulate meaning from the smallest of detail. My favorite example of this is the description of Tom and Arlene’s cluttered kitchen table in “Visiting Tom.” Please comment on the amount of detail you insert into your writing, and how you choose which details to emphasize. MP: Sometimes I overdo it. I've had people say they skip those parts. It comes from John McPhee, who was well known for inserting paragraphs of pure description just to create a sense of environmental veracity, if you will. As far as choosing details, I primarily want items that reflect the nature or purpose of the setting as it relates to the story. Second, I am always looking for those slightly offbeat items that refresh the reader's interest and yet don't disrupt the setting in general (the miniature mirror ball in my brother-in-law's shop). Finally, I choose items and arrange them based on the poetic quality of the words themselves. Syllables, rhythm, assonance, all of those things. DG: As a writer of personal, narrative non-fiction, you’re always a character in your work. As such, a Michael Perry persona has developed, and it seems to have been perpetuated and deepened in your radio work and in the “Clodhopper Monologues.” As true to yourself as you can possibly stay, it seems there would inevitably be some instances where the persona and the real person diverge. How do you maintain your own identity, and how do you prevent the persona from consuming the person? MP: My immediate family does a fine and thorough job of sandblasting any lingering "persona" from my boots (and elsewhere) the moment I step through the front door. 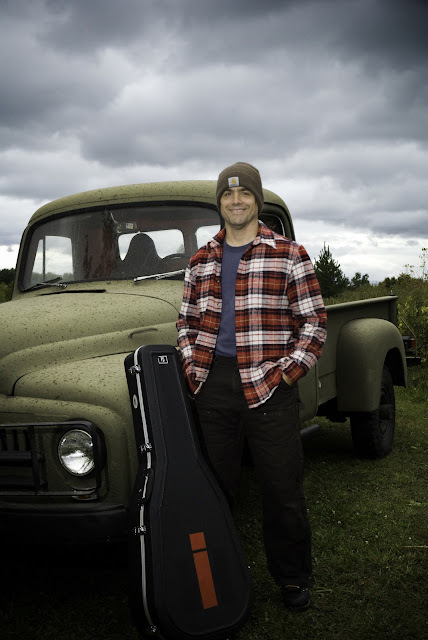 Obviously, when I am performing as a humorist or a singer, "persona" plays a role…but even then, when I turn sincere, or talk about my own self doubts and shortcomings, that is simply me. I know what an imperfect stumblebum I am, and why pretend otherwise? DG: In your experience, what is the most common misconception folks from either coast have about Wisconsinites? MP: That we all have a red barn, a black and white cow, and a tub of cheese soaked in beer. But those are pretty benevolent stereotypes, and let's face it, our foam-cheesehead-per-citizen ratio is pretty high. That said, I do often take the opportunity to point out that the inner city Milwaukee experience is every bit as Wisconsin as pulling bluegills out of some northern lake. DG: Your books have sold very well. What do you think resonates with readers from different back grounds? Have your books sold internationally? I’m interested in whether the themes and subject matter you write about are uniquely American, or are more universal. MP: People are people, as the cliche goes. The accents and the number on the sign change, but not human nature. In Population, I write about my friend and fellow firefighter, a cross-eyed butcher. In Mississippi I signed a book for a man who made me look at his firefighter jacket, then pointed to his severely crossed eye, then loudly declared, "AND I'm a BUTCHER." I was right at home, a thousand miles from home. DG: One of my very favorite pieces of yours is the essay, “Branding God” from “Off Main Street.” I always come back to the passage where you compare the power of the charms of the young girl against Brother Tim and his “stage, and the sound system, and the raging heavens.” I admire the respect you show to Brother Tim, even as you lose your own faith in him and the institutions he represents, and it’s a profoundly powerful and sad moment when he scans the crowd and no one has risen. This not-so-simple respect shown for all of your characters is one of the truly remarkable facets of your writing. How much of this respect comes from your upbringing, specifically from the church you were a member of when growing up? MP: My parents were firm in their beliefs and remain firm in their beliefs, and yet I have watched them live lives of utter humble compassion in act and deed. I will never live up to their example (have already failed) but I guess what I try to do is put myself in the shoes of others, and even if I can't agree with them, I try to say so between the lines rather than smack them with some self-righteous stick. Every major change in my beliefs and thinking (and there have been some big ones) has come about through extended (as in, years) of conversation and consideration, and not someone yelling at me or peppering me with bumper-sticker aphorisms. DG: Explain for our readers why the quality of a cheese curd is measured by its squeak. MP: The squeak is the essential, ineffable essence of the curd, and is, therefore, unexplainable.